There isn’t a webcomic author in existence that I know of that does psychological horror as good as you do. I am truly invested, in love with, and scared of your characters. Especially Doc! His egotistical, self-centered, and depressive personality makes him all the more appealing as a character. Doc goes through some pretty tough stuff throughout the story. Like, explosions and mutant cats. Yet, with the most recent update it looks like he’ll pull through! Thanks for giving us viewers some hope! It may not last, but I can not wait to see what happens next. Not only do you have an amazing plot going on, but I think your artist talent is amazing as well. The way you draw action is very fluid and keeps the eye moving. You really have put a lot of thought in planning out your panels. You art style is something I really love. Each character’s face and design is very distinct and stylistic. 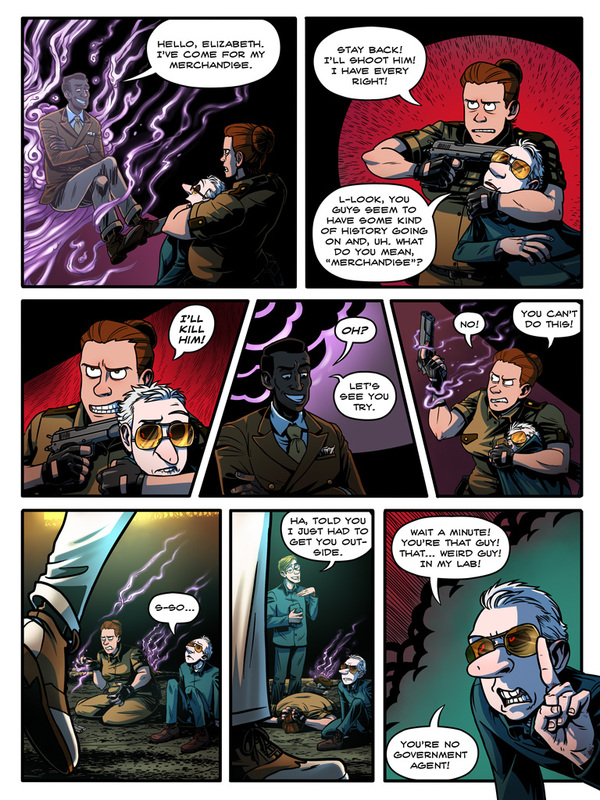 String Theory is a truly special webcomic experience! Keep being creative and working hard! All Images Copyright Dirk Grundy.